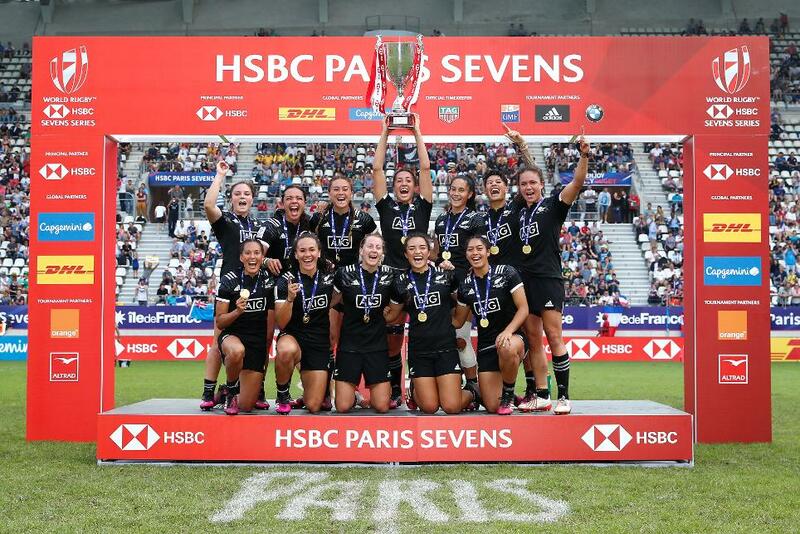 New Zealand finished the HSBC World Rugby Women’s Sevens Series in style with a convincing 33-7 win over rivals Australia in the final of the HSBC Women’s Paris Sevens to take the gold medal. Both teams had reason to celebrate at the final whistle as the silver medal in Paris means Australia secure the overall series crown by virtue of their consistency across the series, finishing on the podium in each of the five rounds. Australia finished the series with 92 points, ahead of New Zealand on 90. Hosts France claimed the series bronze medal despite being defeated 17-10 by Canada in the third-place play-off match in Paris. The exuberant French crowd were treated to a celebratory haka by the Black Ferns Sevens after their dominant display in the Paris final. A five-try haul included series leading try scorer Portia Woodman add two tries to take her personal tally to 43 for the series and 215 points in total. Earlier on finals day USA overcame Fiji 28-7 in the fifth-place play-off, while Spain beat England 20-7 to finish seventh. Japan will be replaced by China in the 2018-19 series, which kicks off in Glendale, Colorado with the newly added HSBC USA Women’s Sevens on 20-21 October 2018. Before then all eyes will be on the Rugby World Cup Sevens 2018 as the top 16 women’s and 24 men’s teams will compete to earn the title of world champions at the AT&T Park in San Francisco from 20-22 July in what promises to be a spectacular showcase of rugby sevens. Over 72,000 tickets have already been sold and further details can be found at https://www.rwcsevens.com/tickets.